We are finally continuing on with our large family house tour! I finished our kids’ bathroom, which is also our guest bathroom, and I’m pretty happy with it for now. 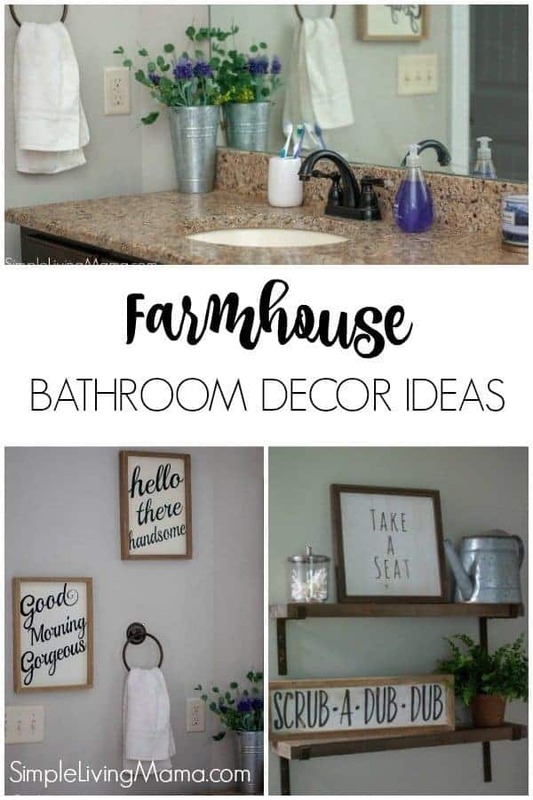 Today, I’m going to show you the farmhouse bathroom decor ideas I incorporated into the bathroom. I love the farmhouse look, and have for a really long time. I’m slowly doing some updates around the house and bringing in those farmhouse decor touches. 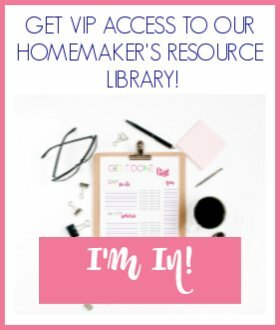 I just love turning a house into a home! When we moved into this house I knew I wanted to do a farmhouse theme with my decor. I have slowly added new pieces here and there, and a year later I have finished decorating our kids’ bathroom! I really like how it turned out. 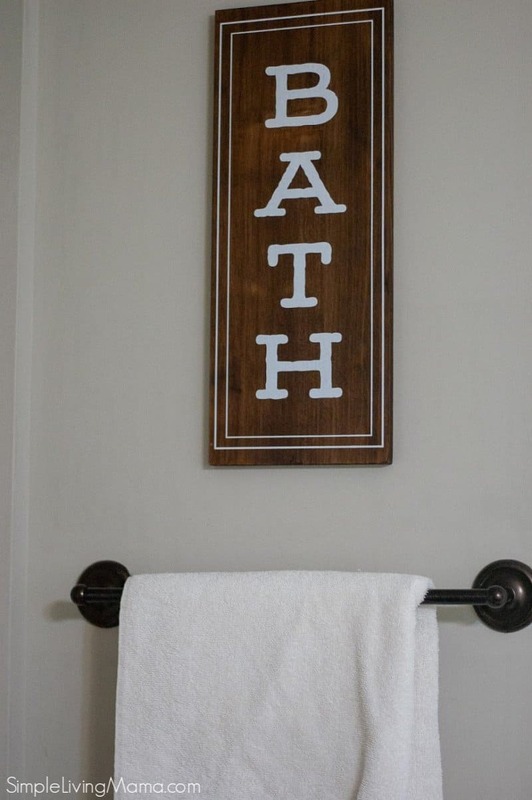 I purchased all of our farmhouse bathroom wall decor from Hobby Lobby. 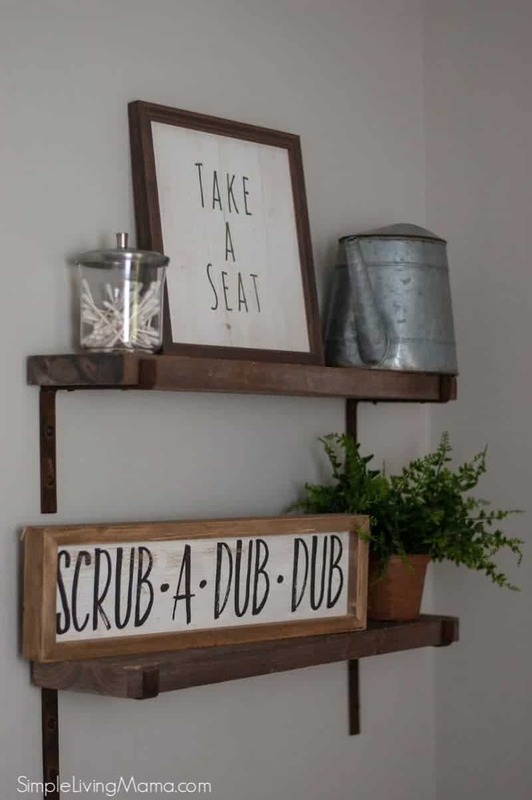 I love the cute wooden BATH sign, the rustic shelves above the toilet and the signs there, and the cute galvanized watering pail. I also decided to add a little greenery with this plant from Hobby Lobby, as well. 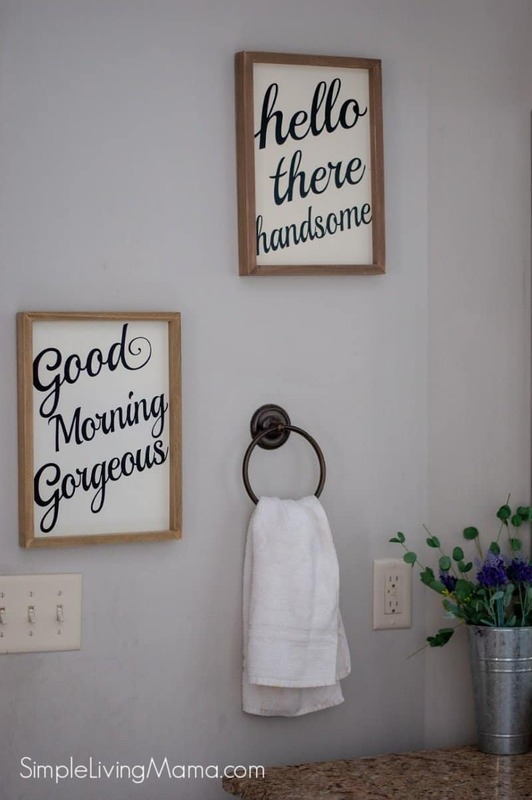 Above my hand towel holder, I placed these cute vintage looking signs that say, “Good Morning, Gorgeous,” and “Hello Handsome.” I think they add just an extra special touch to the space. I honestly didn’t spend a ton of time looking for a shower curtain. 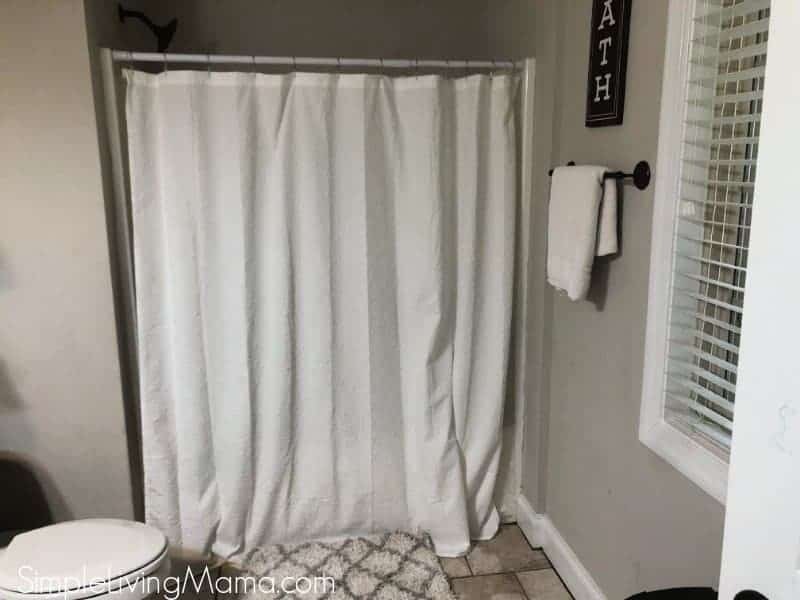 I knew I wanted an all-white shower curtain, so I picked up this Better Homes and Gardens shower curtain from Walmart. I think I would have preferred something with ruffles, but this one works well enough. It has a shell design on it. I wanted to keep the bathroom counter fairly clutter-free, so I added this galvanized pail and put some eucalyptus and fake lavender in it from The Dollar Tree. I like the touches of purple. 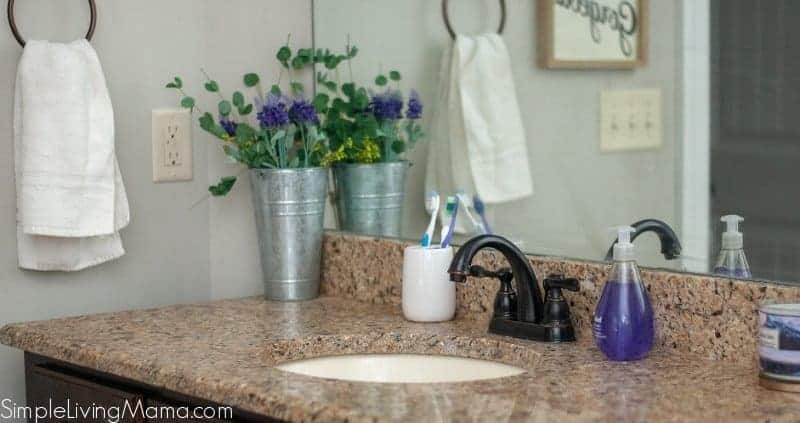 This Method lavender hand soap is from my favorite place to buy cleaning supplies, Grove Collaborative, and it adds another nice touch of purple to this neutral space. 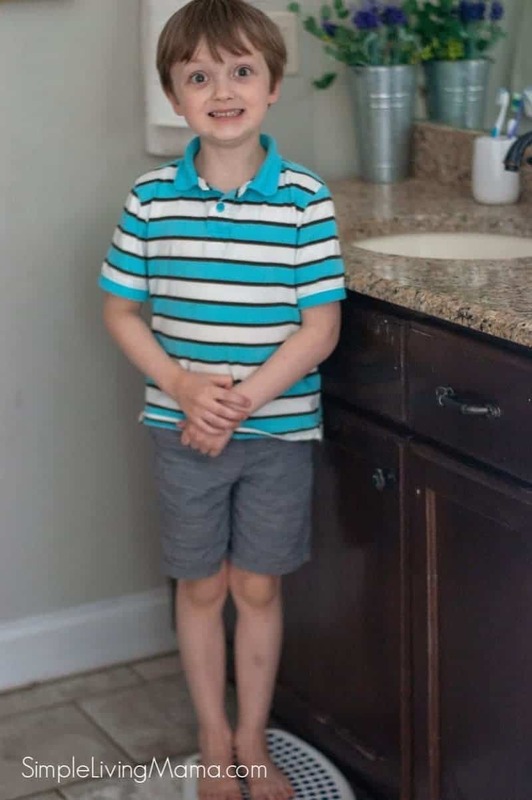 The kids who don’t have electric toothbrushes keep their toothbrushes in this white holder from Walmart, and right now that is all I have on the counter. Less is more! Our rugs are the Better Homes and Gardens brand from Walmart. These are similar. I actually purchased these rugs when we first moved in, and they have held up pretty well despite multiple washings. I now only purchase white towels and wash cloths. I find I like that I can just toss them in the washer and bleach them if needed. They are easy to maintain that way. I really would rather have hooks for each child to hang their towel, but since we rent, I’m not too keen on changing the towel bar. For now, we just have the children hang up their towels after they are done. 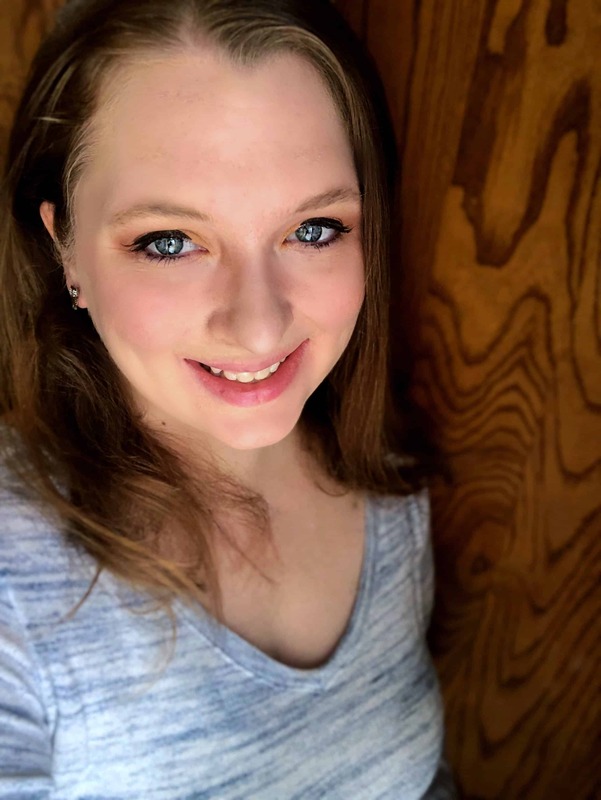 It typically looks a bit messy, but it’s real life. Also, since I have several small children, I purchased this step stool. It works amazingly well for the littles to reach the sink! All of our towels, extra toilet paper, and a few cleaning supplies are kept under the sink. We keep toothpaste, hair brushes, and a few other personal hygiene items in the drawers. 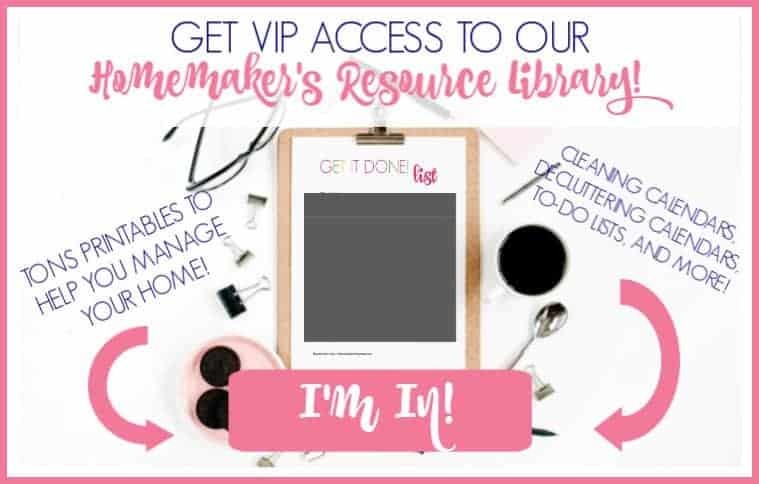 I’m sure as my children grow and have more items we will have to work out a different arrangement for their personal things.